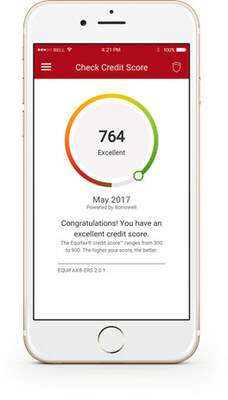 Canada’s banking group CIBC, fintech firm Borrowell and Equifax Canada have unveiled a free credit score for mobile banking users – a “first for a major Canadian Bank”. The credit score is accessed through the CIBC mobile banking app, and clients can get their Equifax credit score which will be updated quarterly, allowing them to track their financial standing. In addition, they will have access to information on factors that affect a credit score and advice on how to improve it. Aayaz Pira, SVP, CIBC digital, retail and business banking, says the app lets people “have a full picture of their overall credit health, and better control of their finances”. Borrowell provides the online platform which draws on credit bureau data compiled by Equifax. CIBC says its service is considered a “soft” credit inquiry, meaning it won’t negatively impact a client’s overall score. To bolster its app launch, CIBC cites its own recent research which showed the majority of Canadians recognise the importance of knowing their credit score to safeguard against fraud, yet more than two-thirds do not know their credit score (69%). Two-in-five (45%) say they have no idea where to obtain their credit score. The service will be available online for all CIBC clients “later this year”. Canada’s CIBC bank has launched a novel promotion aimed at increasing uptake of NFC technology for mobile payments. National Australia Bank (NAB) says it has successfully transferred AU$10 ($7.6) – using Ripple's blockchain tech – from Australia to Canada. It took ten seconds to process.